Educational Policy Improvement Center (EPIC) is Now Inflexion! We love working with educators who are committed to a culture that truly supports students as they develop the skills needed to become lifelong learners. The decisions made to create this change are not easy ones, but end up being the inflection points that develop environments where students can show what they can do with their knowledge, rather than just master content or do well on a test. This is why, we have decided to change our name from the Educational Policy Improvement Center (EPIC) to one which better describes our partnerships with educators. As Inflexion, we are thrilled to continue our journey to ensure all students graduate ready for college, career, and life. Our physical addresses and phone numbers have not changed, but we do have a new website – www.inflexion.org. And you can now reach our our team from the email addresses firstname.lastname@inflexion.org. 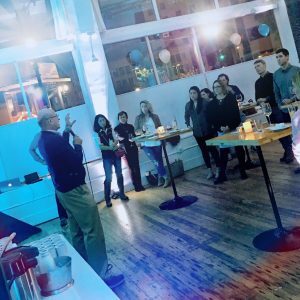 On Friday, November 3, 2017, our board of directors, staff, and local partners and friends came together in Portland, Oregon to celebrate the successful launch of our new brand and name. This event was the culmination of an 18-month journey to discover and articulate who we are and where we are going. We were expertly guided on this journey by our “brand therapist” Jason Halstead of Gist Brands. Jason was unfortunately out of the country and unable to attend the event, but we will take this opportunity to thank him for his support and insight! Our founder Dr. David Conley opened the event with a brief history of how EPIC had a strong and bold vision from the beginning to ensure students graduate ready for some form of postsecondary learning and provided his whole-hearted support as we move forward as Inflexion. Matt Coleman, our Executive Director, then set the stage for how we intend to build upon this history and join educators in their daily work to make this vision a reality for ALL students. Thank you to everyone who joined us for such a fun night! Summer, Summer, Summertime! Time to Sit Back and Read! 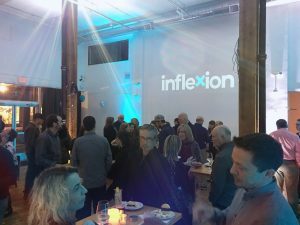 Inflexion Learns | January 2018 | A new year, a new name, and new goals.